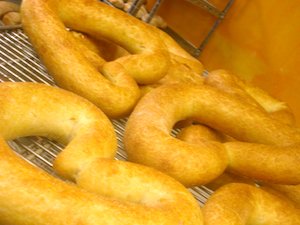 This is a recipe for the most basic French bread, made with a poolish to increase flavor. PDF here. Turning a regular baguette into a heart is easy. Learn how. This is a recipe for sourdough starter and bread. Not all starters have the same consistency; if you got a sample of starter from me, however, this is what you need! (If you want to get a sample of starter from me and you live nearby Hillsborough, let me know.) PDF here. This is a great recipe to use when you feed your sourdough starter; the starter you “throw out” when feeding is the perfect amount to make a batch! These muffins work even if your starter is not 100% active. PDF here. 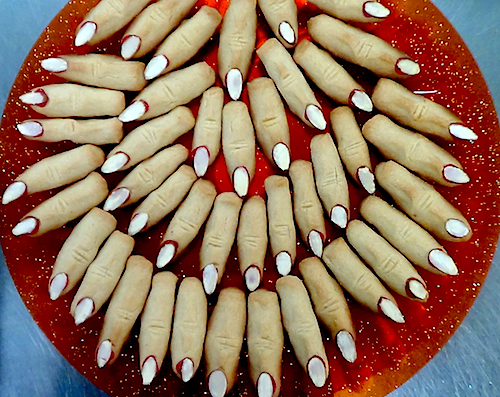 Here’s how to make creepy finger cookies for Halloween. Bonus: Banana Ghosts! Recipe here. A Christmas classic in the Buehler family. Recipe here.